[If you want one classic well proven vaccine example to expose the true psychopathic nature (see: Allopathy Inc personality profile) of the vaccine/medical industry, this would be it. 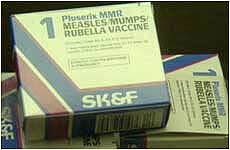 This is the MMR vaccine with the Urabe mumps strain, called Pluserix & Immravax in UK, Trivirix in Canada. 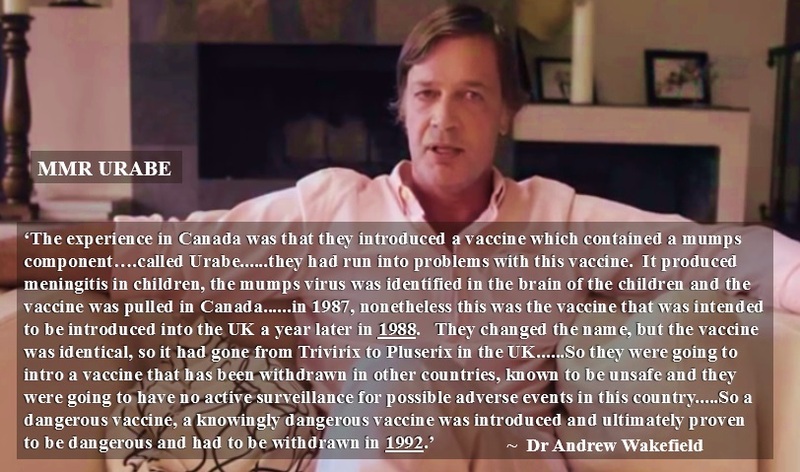 Canada withdrew licences for the vaccine in May 1988, yet the Joint Committee on Vaccination and Immunisation still went ahead and introduced it into the UK, in 1988! Four years later, on September 14, 1992 it was eventually banned in the UK after it was revealed that children developed meningitis. On Sept 16, 1992 the New Zealand government withdrew Pluserix (see: MMR timeline). Five years later in 1997: the Smith Kline Beecham Urabe MMR jab was used in a mass vaccination programme in Brazil & Italy was still using Urabe strain MMR vaccines until 2006 1 . Just one example of the complete disregard for child health from vaccine companies and Pharma shills such as the UK Government. [2011 May] UK Government Documents on Aluminium in Vaccines by John Heptonstall It has been found that Calcium Gluconate solution in glass vials contains almost 200 times more aluminium than Calcium Gluconate in plastic vials; this is due to the solution leeching aluminium from the glass.....Many vaccines are packaged, and stored for long periods, in glass vials with rubber stoppers, and aluminium is a commonly used adjuvant at specific concentrations, the MHRA findings suggest that these concentrations of aluminium may have been heavily contaminated by leeched aluminium at levels which should cause concern. ....Examples of vaccine containment include Pluserix vaccine, manufactured by Smith-Kline Rit, SA, gained Product License No. 002/0166 in 1988 under the Medicines Act 1968 and is described on the Part 1 Schedule as being contained in neutral type 1 glass vials with bromobutyl rubber stoppers, aluminium overcaps and flip-off tops, along with the diluent in neutral type 1 glass ampoules or vials with butyl rubber stoppers and aluminium overcaps. Immravax, manufactured by Institut Merieux, received Product Licence No. 6765/0020 in 1989 which describes the vaccine as being contained in single or multidose glass vials. Infanrix, the Hib DTP-IPV vaccine of GlaxoSmithKline uses glass vials. Meningitec manufactured by Wyeth is also stored in glass vials. The recently hyped H1N1 vaccine issued in millions of doses prepared in glass vials each containing 10 individual patient doses; in Chicago alone more than 100,000 persons were inoculated with that vaccine; will Chicago experience an associated increase in mental deterioration as neurological effects take hold amongst that vaccinated group? 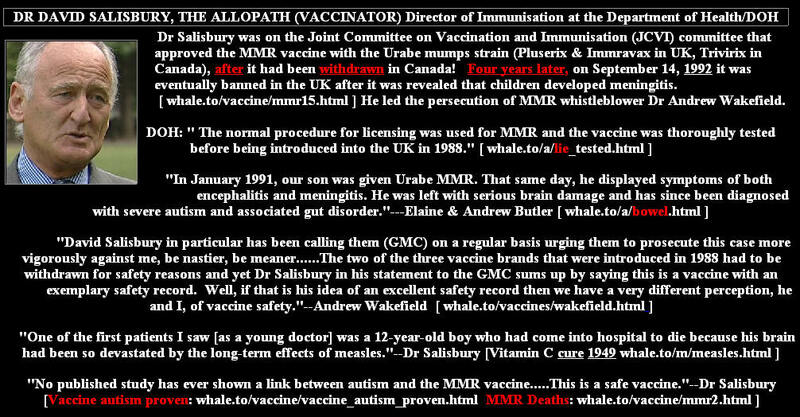 [March 2007] Early fears about MMR in secret papers Katie Stephen was a healthy baby girl when she was injected with the MMR triple vaccine. Ten days later she was vomiting, delirious and running a fever. That was in 1990. Seventeen years later, she is deaf in one ear.....Toby Stewart of west London was one of the children given it. He soon developed encephalitis-type symptoms and was left with what his father Andy, a business consultant, describes as "low-scale brain damage". [Media June 2000, MMR--meningitis & death] Mothers regret over son who still suffers JULIET Parsons still finds it difficult to talk abut the time her son developed meningitis after he was given the Urabe jab nine years ago. She said Matthew continues to suffer side effects. He has learning difficulties, still has fits and regularly gets ill due to a weak immune system. The aim of this retrospective study was to evaluate the incidence and the characteristics of spontaneously reported aseptic meningitis (AM) in France following mumps vaccination with monovalent or multivalent vaccines containing the Urabe strain. Fifty-four cases of AM were reported to the regional drug surveillance centres or to the manufacturer from the time each vaccine was launched up until June 1992. Twenty cases were associated with the time off administration of a monovalent mumps vaccine and 34 with a trivalent measles, mumps and rubella vaccine (MMR). A mumps virus was isolated in four cases in the cerebrospinal fluid and an Urabe-like strain was characterised twice by polymerase chain reaction (PCR). A probable mumps origin was assumed in 17 other cases where the patients presented with other clinical or biological signs of mumps infection. The clinical outcome of AM was always favourable. The global incidence of mumps vaccine-associated AM was 0.82/100,000 doses, which is significantly lower than the incidence in the unvaccinated population. Even considering that the actual incidence of AM is much higher when assessed by active surveillance studies, the risk/benefit ratio of mumps vaccine remains in favour of vaccination. The incidence of mumps vaccines containing Jeryl Lynn (ROR Vax et Imu ORR) associated with AM needs to be evaluated.